Professional explorer, president of the Russian Geographical Society’s Arktika public foundation for supporting expeditionary activity, full member of the Russian Geographical Society since 1984, member of the Russian Association of Polar Explorers, member of the National Geographic Society (USA), member of the Explorers Club (USA) since 1994, VSC 7246, member of the Expert Council of the Russian Ministry of Civil Defense, Emergencies, and Disaster Relief, member of the International Roerich Center’s Board of Trustees, organizer and leader of 26 high-latitude expeditions, including three unassisted skiing expeditions to the North Pole, the world’s first unassisted skiing trans-Arctic expedition from Russia to Canada across the North Pole, and the first international nongovernmental expedition to the South Pole dedicated to New Year 2000. Born July 27, 1946 in the city of Ussuriisk, Primorye Territory. 1969: graduated from Military Armored Forces Academy in Moscow. 1991: discharged from the Russian Armed Forces with the rank of colonel. Recipient of 16 state awards. 1990: awarded an Honorary Certificate of the Russian Geographical Society and the Przhevalsky Gold Medal for a series of high-latitude expeditions in 1985-89. 1990: awarded the Honored Master of Sport of the USSR title. 1995: awarded the Master of Sport International Class title. Mr. Chukov has over 250 publications in the Russian and foreign press. According to Adventure Stats, an independent international expert group, he is the first person in the world to make four unassisted skiing expeditions to the North Pole. 2006: Russian Silver Pen literary award for a series of articles about Arctic trips. 2007: Vladimir Chukov’s biography was included in Britain’s Who Is Who, founded in 1849. 2007: awarded the Honored Polar Explorer title. 2008: elected a full member of the World Academy of Sciences for Complex Security, awarded the international Global Security Order. 2010: awarded the Merited Explorer of Russia title. 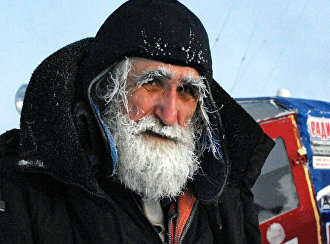 2011: awarded the Outstanding Explorer of Russia title in connection with his 65th birthday.